Dan Patrick’s ready for the majors, but Sports Jeopardy! is still in Spring Training. Sony-owned Crackle made an interesting move over the summer: air a once-a-week sports-themed version of America’s most beloved trivia game. Sony’s tried things like this with success (Rock and Roll Jeopardy!) and failure (Jep!). But never have they produced a game show for online consumption. They secured Dan Patrick, one of the elder statesmen of sports broadcasting, to take the helm as host, and Harry Friedman is still executive producing. Let’s start by saying that at the core of this show, it’s still Jeopardy!. People are questioning answers, wagering, Daily Double-ing and writing down answers in 30 seconds at the end. The format is solid—if it wasn’t solid, it wouldn’t have aired for 2,000 consecutive years in syndication. Deviate too far from the core (like Jep! or even Super Jeopardy!‘s four-player contests) and game show fanatics start to complain. Then again, game show fanatics will complain about anything. Producing game shows for online viewing has a very specific set of challenges: funding, attention spans, advertising, content… the list goes on and on. Sports Jeopardy! made some changes to the classic Jeopardy! format, seeming in an attempt to adapt to an online format. The categories are truncated from 5 clues to four. The game is played for points and not dollars. The winning player banks an even $5,000 and the players with the three-highest point totals go on to play for $50,000. One of the main changes to the game is the amount of material used. In Classic Recipe™ Jeopardy!, a game goes through, at most, 61 clues: 30 in the Jeopardy! round, 30 in the Double Jeopardy! round, and one Final Jeopardy! clue. In Sports Jeopardy!, they go through 49 clues: 24, 24 and 1. I rationalized this change as “Oh, writing 61 clues about sports seems a bit overkill. No one’s going to watch a half-hour of this.” Alex rationalized it as “Oh, they’re going to make the game shorter because it’s online.” Both of these rationalizations would have made sense if the game was actually shorter. The time they saved with 12 less clues is negated by the arduous amount of time they spend on the contestants. 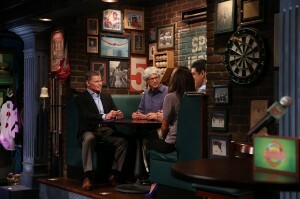 There’s one aspect of this contestant focus that I like: the “post-game interview,” where Patrick and announcer Kelly Miyahara (of the Clue Crew) sit with the contestants in a cramped pub booth and dissect their gameplay decisions. I’ve been in those post-game talk to the host things and they’re actually fun when you’re listening to contestants who have just played a game talk about what they just went through. That part, I like. That’s WAY too long. It’s easy enough that since this is an online show, you can just fast-forward through it, but I shouldn’t have to. The other thing that was jarring about the whole presentation was the amount of advertising that showed up in-game. The promo videos didn’t show the giant “Download the Mobile App” advertisement underneath the scoreboard, nor did it show the obviously-placed-in-post Buffalo Wild Wings advertisements on the podium (which I’m not actually complaining about—that shows they know their audience. And I had B-Dubs for dinner yesterday. Same page, Crackle). How many ads can you spot in a 20-second snippet? WHY IS THE DAILY DOUBLE SPONSORED!? AND WHY DID NO ONE MENTION IT?! I’m all for having elements of this show sponsored. It’s an online broadcast. Its budget needs to be supplemented with in-stream sponsors. But to just sloppily tack on a B-Dubz logo right before a Daily Double clue (the only time it happened during the episode) seems like a missed opportunity to sponsor the Daily Doubles from the get go. Dan Patrick is, not surprisingly, a very good Jeopardy! host. His first showing shows a respect toward the Jeopardy! cadence that we’ve come to expect after 72,000 years of Jeopardy!. His clue reading is top notch, his pacing is very Trebek-like, and his ad-libbing, while leaning too much on some verbal crutches (“Anyone?”), is going to get better with practice. If, like I suspect, this is one long training camp for Patrick to take on Jeopardy!‘s podium, they couldn’t have picked anyone better. There are some changes they made to the show that I actually do like. Having Kelly Miyahara as an on-screen announcer is an excellent change of pace and gives the show a very Rock and Roll Jeopardy! vibe. The introduction to the show is less streamlined and slightly out of order (theme-host-contestants) to what we’re used to (theme-contestants-host), but it works for the show. Having Upper Deck sponsor baseball card-like player introductions is a nice touch, as well. 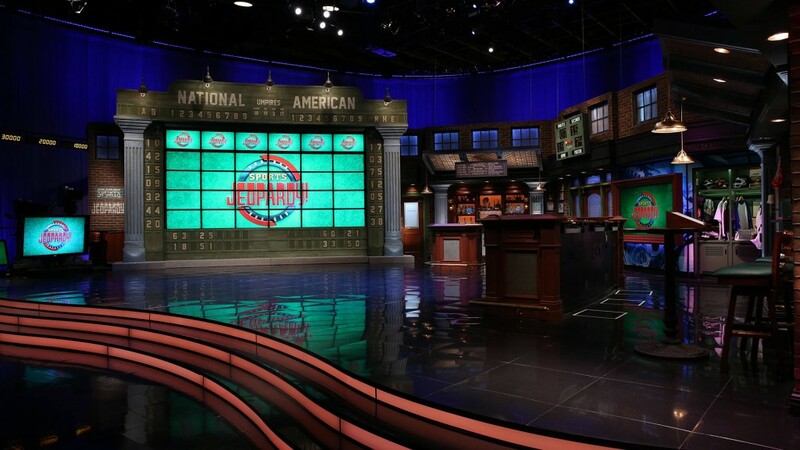 The set is fantastic and evokes a great sports bar vibe. I also like that the three highest point totals come back to play a championship game. With no returning champions, this means that you have to go big or go home—a perfect mentality for a sports-themed competition. Although Dan Patrick shines, and although the game is still solid and challenging, the shortened pacing of the game–and the questionable decision to fill that time with awkward interviews instead of shortening the game altogether—really takes the wind out of the proceedings. I would hope that since there are 51 more episodes and each episode takes a week to upload, that some of these questionable decisions get fixed. Smoother advertising and shorter in-game interviews (but keep the post-game show!) would elevate Sports Jeopardy! to a template of online game shows that other content creators should follow. OH AND AS A BONUS: HERE’S THE FINAL JEOPARDY MARCHING BAND REMIX! Dan Patrick shines as host but questionable presentation and directing choices slow down the pacing of the show. Sports Jeopardy! either needs to be shorter, time-wise, or longer, gameplay-wise. Crackle Dan Patrick Sports Jeopardy!